Discover how to design and implement a positive plan for your son's development, using the powerful principles of mentoring, intentional blessing, and rites of passage, so that he becomes the man God created him to be. Without guidance, a boy's transition from childhood to manhood is dangerous and confusing. With tragic results, today's boys rarely learn from the adults closest to them what it means to become a man. In this celebratory and hopeful book, parents and other concerned adults learn how to guide boys and young men on their journey to maturity. Included in the book are chapters on how single mothers and grandparents can host celebrations for their sons, as well as how to host a rite of passage for sons that have already made some bad choices in their lives. In addition, the book explores how churches, community groups, and men's ministries can get involved in turning our nation's youth problems around. "As tears streamed down my face, my wife asked, 'Why are you crying?' I contemplated blaming the spice in my Thai food, but the truth was that Boy's Passage - Man's Journey had struck a chord in my heart that ran very deep. 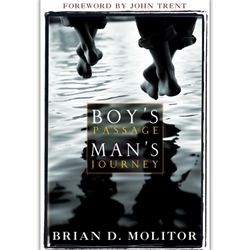 As a father of six, I found Brian Molitor's books were just what I had been praying for - a complete and practical plan for mentoring, blessing, and hosting a rite of passage celebration for each of my children."